Sigma Estimates is specialized in 5D BIM and cost estimation providing software for the AEC industry to mitigate estimating errors and save time on estimating. 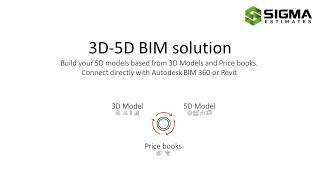 This simple-to-use Autodesk® BIM 360® app from Sigma Estimates is created for the AEC industry to gain a quick and easy way to create your 5D BIM/VDC model, budget or cost estimate from your 3D model, even connecting to existing 5D models and data. Build a 5D model, budget or cost estimate directly from a 3D model in BIM 360 - in a few clicks. Extract quantities from a 3D model in BIM 360 to connect with a 5D model, budget, or cost estimate. Visually understand and explore the connections of the 3D/5D models. Slice'n dice the 3D/5D connected model to validate data for outliers and missing information. Build on your own historical cost data or take advantage of recognized RSMeans data. The Sigma Estimates software also works directly with Autodesk® Revit® using a Live Link for 3D-5D modelling. First version with complete functionality to import 3D model and combine with commercial or local price books for a complete 5D model cost budget. Tipo de inicio de sesión: No se requiere inicio de sesión.